In silver, the total open interest FELL BY A CONSIDERABLE 5170 contracts from 208 ,500 DOWN TO 203,330 WITH YESTERDAY’S TRADING IN WHICH SILVER FELL BY A RATHER LARGE 27 CENTS. THE CROOKS WERE SOMEWHAT SUCCESSFUL IN COVERING SOME THEIR MASSIVE SILVER SHORTS. YESTERDAY WE NO DOUBT HAD SOME OF OUR NEWBIE SPEC LONGS WERE STOP LOSSED OUT OF THEIR CONTRACTS TO WHICH OUR BANKERS DUTIFULLY COVERED. RESULT: A GOOD SIZED DROP IN OI COMEX WITH THE CONSIDERABLE 27 CENT PRICE FALL. NEWBIE SPEC LONGS WERE AGAIN STOP LOSSED OUT OF THE SILVER ARENA TO WHICH ARE BANKERS DUTIFULLY COVERED. In ounces, the OI is still represented by just OVER 1 BILLION oz i.e. 1.016 BILLION TO BE EXACT or 145% of annual global silver production (ex Russia & ex China). In gold, the open interest SURPRISINGLY FELL BY A TINY 584 CONTRACTS DESPITE THE GOOD SIZED FALL IN PRICE OF GOLD ($4.75) WITH YESTERDAY’S TRADING . The new OI for the gold complex rests at 536,843. NEWBIE LONGS RE-ENTERED THE ARENA TO WHICH THE BANKERS DUTIFULLY SUPPLIED THE NECESSARY SHORT PAPER..OUR BANKERS WERE UNSUCCESSFUL IN COVERING ANY GOLD SHORTS. Result: A GOOD SIZED INCREASE IN OI WITH THE FALL IN PRICE IN GOLD ($4.75). WE HAD MINIMAL BANK SHORT COVERING AS WE HAD NEWBIE LONGS RE-ENTERING THE GOLD COMEX AREA TO WHICH OUR BANKERS DUTIFULLY SUPPLIED THE NECESSARY SHORT PAPER. we had: 7 notice(s) filed upon for 700 oz of gold. 1. Today, we had the open interest in silver FELL BY A LARGE 5,170 contracts from 208,500 DOWN TO 203,330 (AND now A LITTLE FURTHER FROM THE NEW COMEX RECORD SET ON FRIDAY/APRIL 21/2017 AT 234,787) WITH THE CONSIDERABLE FALL IN SILVER PRICE (A DROP OF 27 CENTS). OUR BANKERS WERE MILDLY SUCCESSFUL IN THEIR ATTEMPT TO COVER SOME OF THEIR SILVER SHORTS. NEWBIE LONGS IN SILVER EXITED THE ARENA AS THEY WERE STOP LOSSED OUT OF THEIR CONTRACTS BY THE BANKERS. RESULT: A GOOD SIZED DECREASE IN SILVER OI AT THE COMEX WITH THE 27 CENT FALL IN PRICE (WITH RESPECT TO YESTERDAY’S TRADING). OUR BANKER FRIENDS WERE MILDLY SUCCESSFUL IN THEIR ATTEMPT TO COVER SOME OF THEIR HUGE BURGEONING SILVER SHORTS . . . NEWBIE LONGS EXITED THE SILVER ARENA AS THEY WERE STOP LOSSED OUT OF THEIR LONGS TO WHICH OUR BANKERS DUTIFULLY COVERED THEIR SHORT PAPER. i)Late TUESDAY night/WEDNESDAY morning: Shanghai closed UP 1.89 points or .06% /Hang Sang CLOSED DOWN 86.74 pts or 0.30% / The Nikkei closed DOWN 23.78 POINTS OR 0.10%/Australia’s all ordinaires CLOSED UP 0.03%/Chinese yuan (ONSHORE) closed UP at 6.6288/Oil DOWN to 56.93 dollars per barrel for WTI and 63.48 for Brent. Stocks in Europe OPENED RED . ONSHORE YUAN CLOSED UP AGAINST THE DOLLAR AT 6.6288. OFFSHORE YUAN CLOSED WEAKER TO THE ONSHORE YUAN AT 6.6356 //ONSHORE YUAN STRONGER AGAINST THE DOLLAR/OFF SHORE WEAKER TO THE DOLLAR/. THE DOLLAR (INDEX) IS WEAKER AGAINST ALL MAJOR CURRENCIES. CHINA IS VERY HAPPY TODAY. Bankers warn that thousands of jobs will leave Great Britain if their Brexit solution is not forthcoming. Iran slams Saudi Arabia on the ballistic attack on the Saudi Airport. They claim Iran had nothing to do with it. ib)Markets do not like this: Another delay on the tax bill as it will not be released on Thursday. Mnuchin admits that the Corporate tax cut delay in implementation is likely. My bet: nothing gets passed. The total gold comex open interest SURPRISINGLY FELL BY A TINY 584 CONTRACTS UP to an OI level of 536,843 WITH THE GOOD SIZED FALL IN THE PRICE OF GOLD ($4.75 RISE IN YESTERDAY’S TRADING). SOME NEWBIE LONGS AGAIN ENTERED THE GOLD ARENA WITH THE BANKERS REGRETTABLY SUPPLYING THE NECESSARY PAPER AS THEY COVERED A MINIMAL AMOUNT OF THEIR HUGE SHORTFALL. Result: a SURPRISE TINY DECREASE IN OPEN INTEREST DESPITE THE CONSIDERABLE FALL IN THE PRICE OF GOLD ($4.75.) WE HAD MINIMAL BANKER SHORT COVERING. NEWBIE LONGS AGAIN ENTERED THE GOLD ARENA EMBOLDENED DUE TO GLOBAL TENSIONS ESPECIALLY IN SAUDI ARABIA. OUR BANKER FRIENDS REGRETTABLY HAD TO SUPPLY THE NECESSARY SHORT PAPER AS THEY WERE TOTALLY UNSUCCESSFUL IN THEIR ATTEMPT TO COVER ANY GOLD SHORTS. We have now entered the NON active contract month of NOVEMBER.HERE WE HAD A LOSS OF 104 CONTRACT(S) DOWN TO 84. We had 110 notices filed YESTERDAY so surprisingly we again gained 6 contracts or 600 additional oz will stand for delivery in this non active month of November. TO SEE BOTH GOLD AND SILVER RISE IN AMOUNT STANDING (QUEUE JUMPING) IS A GOOD INDICATOR OF PHYSICAL SHORTNESS FOR BOTH OF OUR PRECIOUS METALS. The very big active December contract month saw it’s OI LOSE 13,115 contracts DOWN to 345,546. January saw its open interest rise by 147 contracts up to 589. FEBRUARY saw a gain of 10,817 contacts up to 125,397. And now for the wild silver comex results. Total silver OI FELL BY a CONSIDERABLE 5170 CONTRACTS FROM 208,500 DOWN TO 203,330 WITH YESTERDAY’S 27 CENT FALL IN PRICE. WE HAD MILD BANKER SHORT COVERING AS THE CROOKS STOP LOSSED SOME OF SILVER LONGS OUT OF THEIR CONTRACTS WITH RESPECT TO YESTERDAY’S TRADING…. WE MAY HAVE HAD SOME SILVER EFP’S ISSUED FOR DECEMBER, BUT I DOUBT IT..JUST LONGS HIT WITH STOP LOSSES!! . The new front month of November saw its OI fall by 7 contracts and thus it stands at 3. We had 7 notices served YESTERDAY so we gained 0 contracts or an additional NIL oz will stand in this non active month of November. After November we have the big active delivery month of December and here the OI FALL by 7,093 contracts DOWN to 131,204. January saw A GAIN OF 6 contracts RISING TO 745. Today, 0 notice(s) were issued from JPMorgan dealer account and 0 notices were issued from their client or customer account. The total of all issuance by all participants equates to 7 contract(s) of which 0 notices were stopped (received) by j.P. Morgan dealer and 4 notice(s) was (were) stopped/ Received) by j.P.Morgan customer account. The total number of notices filed today for the NOVEMBER. contract month is represented by 1 contracts FOR 5,000 oz. To calculate the number of silver ounces that will stand for delivery in NOVEMBER., we take the total number of notices filed for the month so far at 864 x 5,000 oz = 4,320,0000 oz to which we add the difference between the open interest for the front month of NOV. (3) and the number of notices served upon today (1 x 5000 oz) equals the number of ounces standing. Thus the INITIAL standings for silver for the NOVEMBER contract month: 864 (notices served so far)x 5000 oz + OI for front month of NOVEMBER(3) -number of notices served upon today (1)x 5000 oz equals 4,330,000 oz of silver standing for the NOVEMBER contract month. This is EXCELLENT for this NON active delivery month of November. We gained 0 contracts or an additional NIL oz will stand for metal in the non active delivery month of November. 1. Central Fund of Canada: traded at Negative 2.3 percent to NAV usa funds and Negative 2.4% to NAV for Cdn funds!!!! Note: Sprott silver trust back into NEGATIVE territory at -1.04%-/Sprott physical gold trust is back into NEGATIVE/ territory at -0.50%/Central fund of Canada’s is still in jail but being rescued by Sprott. *LAST 202 TRADING DAYS: A NET 59,42 TONNES HAVE NOW BEEN ADDED INTO GLD INVENTORY. *FROM FEB 1/2017: A NET 28.31 TONNES HAVE BEEN ADDED. Platinum “may be one of the cheap assets out there” and “is cheap when compared with stocks or bonds” according to Dominic Frisby writing in the UK’s best selling financial publication Money Week. The value investor’s lament – where have all the cheap assets gone? Every week in MoneyWeek magazine there’s a small column devoted to great investors from the past. You read a bit about who they were, what their circumstances were and what their methodologies were. Sometimes I’ve heard of them, sometimes I haven’t – but as often as not it seems that they were a value investor of some kind. Value investing is, I suppose, the most basic and instinctive of investing systems. You buy when you deem something to be cheap and you sell when it gets expensive. The principle has been applied for as long as humans have invested money. And yet it no longer seems to work. In this modern age of suppressed rates, quantitative easing, and easy (if you mix in the right circles) money, nothing is cheap – except money itself. Value investors have, mostly, been beaten by index trackers, and those who have simply gone long (ideally with as much leverage as possible), have wiped the floor with the prudent. Sensible, disciplined approaches have not worked. The stock market has flown and taken everything with it. It depends on your valuation matrix, of course, but it’s hard to make the case that stocks are cheap. The Dow, the S&P 500, the Nasdaq – they are all at all-time highs, pretty much. I’m not saying they can’t go higher. But all-time highs is not cheap. The various FTSE indices are also in record territory, same too France and Germany. Japan is at 20-year-plus highs. On a country-by-country basis you might be able to argue somewhere is cheap – Greece (for a reason) – but it’s hard to say there is real value out there in stocks as an asset. The same goes for bonds. The yields on government bonds are, except for exceptional cases, minimal. As low as, 2016 excepted, they’ve ever been. Again, yields could fall – bonds could get even more expensive – but you can’t make the case that government bonds are cheap. The same goes for corporate and junk bonds. In the UK, the real estate market has two sides to it. In places like London, Brighton, Bristol, Oxford or Cambridge, prices bear little relation to local earnings. Then there are other regions where the 2007 highs were never recovered. You could find value in, say, parts of the Midlands or North Devon. But that’s not the same as being irresistibly cheap. Moreover, the future for UK real estate investing does not look good to me – it seems the government does not want to encourage it beyond owning your own home. You start looking at other assets: bitcoin and digital assets. Nope. Not cheap. Art. Nope. Not cheap either. About the only assets I can find that are cheap are in the commodities sector. Oil looks reasonable value. I’m writing this piece from Texas, and I can tell you that oil consumption shows no signs of abating. But the real zinger for me is platinum. It’s as though the kid at school, who used to get straight As in all his grades and be captain of all the sports teams, has suddenly for no apparent reason, been relegated to the back of the class. He’s politely putting his hand up and saying, “Hey, remember me?” but nobody cares. They’re all ignoring him. John wrote about this the other week, but it really is striking. Back in the day, platinum was the star. It was a precious metal, so it would benefit from all the inflation of the 2000s. But it was an industrial metal too, so it would benefit from the industrial expansion. Rare, beautiful, hard to produce. What could possibly go wrong? The world blows up and gold and silver go to the moon – platinum goes there too. The global economy expands, everybody has more money – one thing they spend their new-found wealth on is platinum jewellery. It’s more precious than gold after all. People start driving more. More cars = more platinum. Instead, platinum has gone nowhere, and it’s been forgotten. The body blow seems to have been the Volkswagen scandal. Diesel emissions are greater than stated. The future for diesel cars (which use platinum in their catalytic converters), and thus the future for the precious metal, looks grim. Meanwhile, the whole “gold as money” narrative has upped sticks and and moved to bitcoin. Central banking works apparently, and so there is no need for precious metals. And the wealth created by the economic expansion of the past few years has not trickled down into platinum jewellery buying sufficiently to affect the price. The money must have all gone to rich folk who already own platinum! Any strike or mishap in South Africa that might affect platinum supply (something like 90% of platinum is mined there) has just been met with a global shrug. Well, let me tell you a thing or two, Mr Market, who doesn’t care about platinum. You’re wrong! Gold (at around $1,290 per ounce) is now about 40% more expensive than platinum (around $925). That is not normal. Platinum is supposed to be more expensive than gold. Gold is typically 75% of the price of platinum. To redress that balance , platinum should be around $1,600. 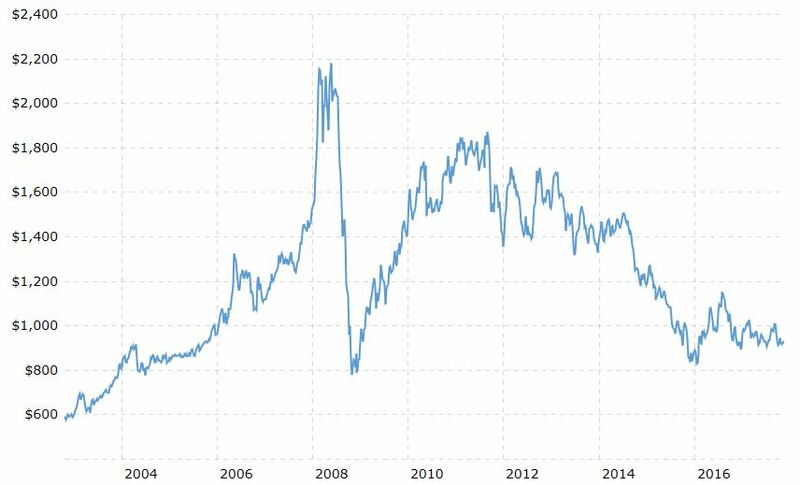 Platinum’s cheap little sister palladium (which is a law unto itself) is now more expensive than platinum. Again, that is not normal. It happens every now and then – well, once since 1970, in 2000-2001 – but it is the exception, not the rule. It’s like a BMW – nice, but not that nice – costing more than a Rolls Royce. Platinum is cheap when compared with stocks or bonds. It is sitting around or just below its cost of production, which is going to strain supply (in fact it already has). Who cares about platinum? Nobody really. It’s amazing that a metal this embedded in our collective psyche is meeting such apathy. The chart below shows the platinum price over the last ten years. You can see the steady decline from 2011 through to 2016, the brief rebound rally, and then further declines. But those further declines have been with much more of sideways bias. In other words, although there aren’t many buyers, the hard selling seems to be done. I get why nobody is buying platinum – there’s no compelling narrative for it at the moment. There’s no reason to buy it beyond that it’s cheap. But nor is there any real reason to sell it. There’s often a cycle to bear markets. First you get the hard selling, then you get the forgotten phase – when an asset is simply overlooked. It seems we are in such a phase now. Although we need not see a huge rise in the near-time, I would say the downside risk here is limited in a way that it isn’t in other asset classes – stocks, bonds, bitcoin – where the downside risk is fairly substantial. It’s a case of accumulating and sitting patiently. Which is what value investors do. Note: The safest ways to own platinum is with platinum coins, platinum bars (delivery and Secure Storage) and platinum certificates all of which are offered by phone by GoldCore. They will be available for online purchase when our new website goes live in the coming days. Bullion’s rally faltered in the past two months as the dollar strengthened and global equities set new records, while concerns over Brexit and Catalonia’s push for independence failed to drum up notable haven demand. Now bitcoin’s surge is attracting investor interest toward the cryptocurrency and away from the metal, the biggest online vaulting service said. As CoinTelegraph notesthough optimists were claiming that Chinese government might free Bitcoin trading under certain circumstances in the future, nobody anticipated that the day is coming this soon. Though it’s still too soon to state that Bitcoin trading is freed by the Chinese government, it’s highly likely that the government, instead of banning Bitcoin and cryptocurrencies is more interested in regulating the market and supervising the trading. Like it or not, a new era of Bitcoin in China is coming, and law and order might play a more significant role now. As CoinDesk details, known for its strong early support from bitcoin startups and mining pools, the plan, called Segwit2x, or simply 2x, was to trigger a block size increase at block 494784, expected to occur on or around November 16th. The suspension was announced today in an email, written by Mike Belshe, CEO and co-founder of bitcoin wallet software provider BitGo. One of the leaders of the Segwit2x project, he argued that the scaling proposal is too controversial to move forward. “Until then, we are suspending our plans for the upcoming 2MB upgrade,” he added. 3b Japan 10 year bond yield: FALLS TO . +.026/ GOVERNMENT INTERVENTION !!!! (Japan buying 100% of bond issuance)/Japanese yen vs usa cross now at 114.07/ THIS IS TROUBLESOME AS BANK OF JAPAN IS RUNNING OUT OF BONDS TO BUY./JAPAN 10 YR YIELD FINALLY IN THE POSITIVE/BANK OF JAPAN LOSING CONTROL OF THEIR YIELD CURVE AS THEY PURCHASE ALL BONDS TO GET TO ZERO RATE!! 3j Greek 10 year bond yield FALLS TO : 5.092??? 30 SNB (Swiss National Bank) still intervening again in the markets driving down the SF. It is not working: USA/SF this morning 0.9989 as the Swiss Franc is still rising against most currencies. Euro vs SF is 1.1577 well above the floor set by the Swiss Finance Minister. Thomas Jordan, chief of the Swiss National Bank continues to purchase euros trying to lower value of the Swiss Franc. Derek Halpenny, head of research at Mitsubishi UFJ in London told Reuters he was dubious over the progress of the tax cuts program being urged by U.S. President Donald Trump’s campaign. “The initial phases of discussions within the House (of Representatives) have brought up a lot of divisions and problems … If the story is true that they’re considering a delay of one year to the corporate tax cut, those big differences will need to be sorted,” he said. Francois Savary, chief investment officer at Prime Partners, said the doubts over the tax issue reinforce the case for some consolidation in the market, which has been fully priced for good news. “It’s something that would impact the domestic stocks in the U.S. and would be a setback for the market in general (and) it’s more than stock specific as people would reassess earnings growth expectations to the downside,” he said. large option expires between 113.50 and 114.50 signalling that the pair will remain in a tight range. Deutsche Bank’s Q3 2017 revenues were €6.78 billion, below market expectations of €6.88 billion. The share price fell 2.7% shortly after the European market open. The problem – like the previous quarter – was a bigger-than-expected drop in trading revenues. Trading revenue was down 30% year-on-year to €1.512 billion versus €2.162 billion in Q2 2017. The challenge for the embattled CEO, John Cryan, is that the trend is still deteriorating. Trading revenues in Q2 2017 fell 18% year-on-year to 1.666 billion euros versus 2.027 billion euros. Earlier this year, Cryan pledged to turnaround the performance of the investment bank as soon as this year. So if you were Deutsche CEO Cryan and you needed revenue growth and you needed it fast, what would you do? One thing is to identify a “hot” sector in capital markets with high margins and go all out for growth, never mind the risk. Which is exactly what Deutsche Bank is doing in the leveraged loan market as Bloomberg implies. They never learn from one crisis to the next. Investment banks have arranged $1.2 trillion of U.S. leveraged loans for clients so far this year, more than any other year since at least 2006 and already 18 percent more than all of 2016, data compiled by Bloomberg show. Adding to the frenzy is the U.S. Treasury Department, which has proposed loosening restrictions imposed on Wall Street banks after the 2008 financial crisis. Some analysts fear this could mean a return to the kinds of high-risk loan deals that saddled lenders — including Deutsche Bank — with billions of dollars of debts they couldn’t sell during the crash. In Deutsche’s defence, it does have “form” in the leveraged loan market, having been a top 5 player before slipping down the rankings as the bank stumbled from one crisis to another. In 2017, Deutsche tumbled to ninth place in arranging US leveraged loans, it’s worst showing since 2012. Then again, the market is already dominated by JP Morgan and Bank of America who, we suspect, are unlikely to roll over to accommodate more market share for their German rival. Consequently, a critical question is how much risk might Deutsche need to take as it seeks to regain its former market position? None according to Deutsche’s co-head speaking to Bloomberg. The decline was caused by “a little bit of bad luck,” said Fedorcik. The firm has also been “more selective” on taking risks “in some cases,” further reducing the amount of completed deals, he said. Deutsche Bank has arranged more than 300 U.S. leveraged loans so far this year, helping clients including software giant Dell Technologies Inc. and hotel chain Hilton Worldwide Holdings Inc. borrow about $61 billion, according to data compiled by Bloomberg. The hires in the U.S. corporate finance business bring staffing level back to where they were at the beginning in 2016, before speculation about its financial strength rattled the bank and management introduced the steepest bonus cuts in the bank’s recent history. Hires this year include Philip Pucciarelli and Robert Verdier, two health-care investment bankers who joined from BMO Capital Markets. Deutsche Bank also added professionals in its trading operations, bringing in Alexandra Cannon from Barclays Plc as a director in leveraged-loan sales in July. Paul Huchro, who retired from Goldman Sachs in 2015, is joining to oversee investment-grade trading globally as well as high yield in the U.S. and Europe, the bank said last month. Okay, but we always get nervous when we sense over-confidence on the part of investment bankers. This was the other co-head speaking to Bloomberg. During his trip to London this week, US Commerce Secretary, Wilbur Ross, wasn’t only defending revelations in the Paradise Papers that he’d invested in a shipping company with ties to the Putin family. He also attended a “closed-door meeting” with executives from JPMorgan, Goldman, HSBC and other banks. The meeting took place over lunch in the exclusive St James’s District (hedge fund land these days) at Wiltons restaurant. Wiltons, if you’re not familiar with it, started as an oyster stand in 1742 before developing a clientele of English aristocrats and foreign dignitaries and latterly, bankers. Ian Fleming, creator of the James Bond novels and bon vivant, listed it as one of his top 10 restaurants in the 1950s. A group of large financial institutions with big London operations, led by Wall Street’s pre-eminent banks, have told the US commerce secretary that Britain’s unstable government and slow progress in Brexit planning may force them to start moving thousands of jobs out of City in the near future. The warnings came on Friday during a closed-door meeting between executives from the banks, which included JPMorgan Chase, Goldman Sachs and HSBC, and Wilbur Ross during the US commerce secretary’s visit to London, according to people briefed on the discussions. Those briefed on the talks, which were held over lunch at Wiltons restaurant in London’s exclusive St James’s district, said the banks were particularly concerned by the failure of Britain to provide clarity over whether it will secure a transition deal to smooth the changing regulatory regime after the UK leaves the EU. They warned they had even less clarity over what a final Brexit deal will look like. Absent clarity from the government about post-Brexit plans, the executives said jobs would move back to the US or to other European capitals as banks begin to enact their worst-case contingency plans, the sources said. ”There was broad discussion around the lack of progress in the Brexit talks and some discussion around various political scenarios,” one person briefed on the talks said. US banks have been among the loudest critics of Britain’s decision to leave the EU since last year’s referendum, with Goldman boss Lloyd Blankfein recently tweeting he anticipated “spending a lot more time” in Frankfurt post-Brexit. But the recent warnings in private meetings with Mr Ross — as well as similar soundings taken by the City of London Corporation, the capital’s local government, on a fact-finding mission to Wall Street and Washington — included a level of urgency not seen in previous criticisms, those present said. The banks warned Mr Ross that a “point of no return” is fast approaching, when they must start moving jobs, capital and infrastructure in order to meet the March 2019 Brexit deadline if no transitional deal is secured. In London’s City A.M. financial newspaper yesterday, the City of London’s policy head, Catherine McGuinness, highlighted rising nervousness in the US financial sector about Brexit. While New York expects to benefit from some of the disruption, the overriding sense was that Brexit could cause global ripples if progress failed to materialise, she added. Fears that the UK would simply “crash out” were also growing. She was speaking after a three-day fact-finding mission, where she met US Treasury officials, as well as Commodity Futures Trading Commission (CFTC) chairman Chris Giancarlo, and representatives from the International Swaps and Derivatives Association (ISDA). McGuinness noted that the recent IRSG report, which set out a blueprint for how financial services might continue to do business after Brexit, had been welcomed in the States. But she acknowledged that progress on the matter back home was painfully slow, saying she had “very little sense” of when – or if – a financial services position paper could be expected from the government. Back to the lunch between Ross and the bankers, the one positive note which emerged for the UK government is that the prospect of a Labour government headed by Jeremy Corbyn fills them with dread. That’s scant consolation, however, as the banks are believed to have drawn up contingency plans to shift 10,000 jobs out of London in the short-term. This number was confirmed by the Bank of England last week. However, the FT notes a much larger exodus is possible if the government fails to set up a transitional deal as part of Brexit. Sam Woods, deputy governor (of the Bank of England), said that a longer-term 75,000 job-loss figure cited in a previous report by Oliver Wyman, the consultancy, was “plausible”. Mr Woods also said that a transitional deal was an asset whose value diminished through time, as banks scrambled to get in place for March 2019. Still, we wonder how sympathetic to London’s Brexit challenges Ross was during the lunch. After all, this is the man who said last December that Brexit was a “God-given opportunity” for other countries to take business away from the UK. Finally, it also crossed our minds as to who picked up the bill? We doubt that it was Ross, or Deutsche Bank, if it was invited. Our guess is Goldman, but what was the catch? On Tuesday Iran slammed Saudi and US claims that it was supplying Yemen’s Houthi rebels with advanced ballistic missiles that Saudi Arabia says targeted Riyadh international airport on Saturday – which would be a violation of a UN resolution which ensures conformity to the Iran nuclear deal. Iran’s state-run IRNA news cited a letter sent to the UN Security Council signed by Iranian ambassador Gholamali Khoshroo, saying that Iran “categorically” rejects Saudi Arabia’s “baseless and unfounded accusations and considers it as destructive, provocative and a ‘threat to use of force”’ against a UN member state in defiance of the UN charter. Iran’s foreign minister further called the Saudi claims “contrary to reality and dangerous”. Iran’s state-run PressTV file photo purporting to show a missile being fired from the direction of Yemen toward Saudi Arabia earlier during the conflict. However, the Iranian ambassador’s letter to the UN responded directly to the charges with, “Such provocative statements by the Saudis are nothing but an attempt to shift the blame and to distract attention from its war of aggression against Yemen.” Other Iranian officials, according to various reports, called the Saudi claims “fake news”. Saudi Arabia has cast itself as the victim of external Iranian and pro-Shia plotting after its internal weekend of chaos which included a missile attack from Yemen, the deaths of two princes and other high officials within a mere 24 hours, and an aggressive crackdown against dissent in the royal family which saw close to a dozen princes placed under house arrest. While lashing out at Iran’s supposed campaign of destabilization in Yemen and in the region, it appears that the Saudis are set to step up proxy skirmishes with Iran across the Middle East, possibly with the support of regional allies. 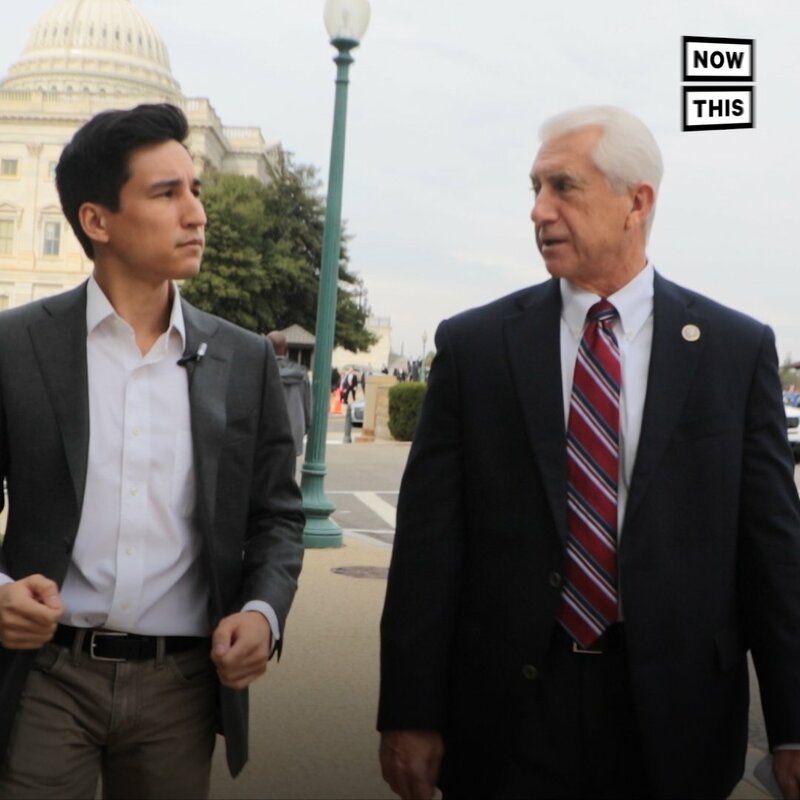 Why don’t these congresspeople want to talk about the war in Yemen? Above: Why is Yemen ignored in US politics? The US itself has been an integral part of the coalition (also including Bahrain, Kuwait, UAE, Egypt, Sudan, and with the UK as a huge supplier of weapons) fighting Shia Houthi rebels, which overran Yemen’s north in 2014. Saudi airstrikes on the impoverished country, which have killed many thousands of civilians and displaced tens of thousands, have involved the assistance of US intelligence and use of American military hardware. Regardless of the degree to which Iran may or may not be involved in advising and assisting Houthi rebels, it is astounding that in the rare moments that US officials actually make reference to the humanitarian disaster in Yemen, it is nebulous “Iranian agents” that are blamed even while American and British bombs are dropped from Saudi-piloted jets on a civilian population. Saudi Arabia has in recent years managed to use the UN to protect and enhance its image when it comes to questions of both domestic human rights abuses and rampant war crimes in Yemen. Absurdly, the autocratic country which has Wahhabi Islam for its official state religion continues to serve its 3-year term on the UN Human Rights Council. But it appears that for now that the Saudi “but Iran did it” line is enough to satisfy Nikki Haley and the US administration. Gas of course is not the be all and end all. In many ways it is a surface marker, the means for regional and global struggles for political power and influence. For Saudi it is the basis of its struggle for regional supremacy with Qatar. For America it is the regional marker for its proxy struggle with Russia for political dominance and for control over gas supplies to Europe. America has sided with Saudi. Russia and China have sided with Qatar. Qatar struck a decisive blow for dominance and for a new Qatar focused power structure when it opened the region’s only clearing house for settlement of Gas contracts in Yuan. Of course, there is a major danger that such a draconian cash grab would result in a violent blowback by everyone who has funds parked in the Kingdom. To assuage fears, Saudi Arabia’s minister of commerce, Majid al Qasabi, on Tuesday sought to reassure the private sector that the corruption investigation wouldn’t interfere with normal business operations. The procedures and investigations undertaken by the anticorruption agency won’t affect ongoing business or projects, he said. Furthermore, the Saudi central bank said that individual accounts had been frozen, not corporate accounts. “It is business as usual for both banks and corporates,” the central bank said. WTI/RBOB extended losses post-API data overnight, but DOE data sparked some algo chaos as a surprise crude build (+2.24mm vs -2.45mm exp) was offset by a bigger than expected gasoline draw (exactly opposite what API reported). In addition, US crude production jumped to a new all-time high – take that OPEC! “If the EIA data disappoints then it could take further steam off the market,” says Jan Edelmann, analyst at HSH Nordbank. USA dollar index early WEDNESDAY morning: 94.91 DOWN 1 CENT(S) from YESTERDAY’s close. the Italian 10 yr bond yield is trading 26 points HIGHER than Spain. The Treasury yield curve continues to flatten. 5s30s is now down 10 days in a row – the longest flattening streak since March 2011 and Dec 2005 – if it goes 11 days that will be an all-time record. Suddenly Republican tax reform is looking deader than a door nail. According to the Washington Post, which cites “ four people familiar with a draft of the legislation ” not only is there little to no compromise on the way forward, but the only thing Senate Republicans leaders can agree on is to punt the centerpiece of the GOP tax plan by at least a year, and are considering a one-year delay in the implementation of a major corporate tax cut. This change would lower the corporate tax rate from 35 percent to 20 percent in 2019, not 2018 as currently constructed by a House GOP bill. And while the delay would save $100 billion in much needed funds, it would be met with resistance from Trump, who wants the tax cuts implemented immediately. In any case, to ensure that companies don’t postpone major investment decisions and wait for the lower rate in 2019, Senate Republicans are considering allowing companies to immediately deduct capital investments in 2018 from their taxable income, the WaPo sources said. The news comes amid the expected growing opposition in the Senate to the current bill. One day after Trump nemesis John McCain said tax reform is “dead on arrival”, on Tuesday, Sen. Ted Cruz said that the House tax bill could end up raising taxes on some middle-class Americans, and he pushed for assurances that the Senate bill would lower everyone’s taxes. Meanwhile, senators Marco Rubio and Mike Lee are pushing for an expansion of the child tax credit beyond what was introduced in the House. They have called for raising the child tax credit from $1,000 to $2,000. The House bill would raised the credit to $1,600. Furthermore, the WaPo adds, that significant differences are also expected on the individual income-tax provisions. Senate negotiators are planning to eliminate the state and local tax deductions that families take, going further than the House bill. They are also expected to retain roughly seven income tax brackets, rather than the four the House has proposed. Details could change ahead of a formal release of a bill this Thursday by the Senate Finance Committee. Separately, Bloomberg reports that on Tuesday afternoon President Trump called into a meeting between Senate Democrats, National Economic Council Director Gary Cohn and White House Legislative Affairs Director Marc Short, Democratic Sen. Jon Tester tells reporters. Tester said that Trump spoke (maybe screamed would be a better description) for about 15 minutes by phone from Asia and insisted the rich will be hurt by the tax bill. During the same meeting, Dem. Senator Sherrod Brown gave Cohn copies of two bills he wants in the tax package, including one that would boost income of those making $20k-$70k. Brown added that Trump said over the phone he liked the ideas in the bills Brown presented; “I don’t know if McConnell is not hearing what the president is saying or if McConnell is not paying attention,” Brown says. Or maybe Trump just hasn’t heard yet that Senate Republicans, after failing to repeal Obamacare not too long, now plans to concede on the most important aspect of Trump’s proposed tax plan. In any case, a decision on delaying the implementation of the corporate rate has not been made, the WaPol said. House Ways and Means Committee Chairman Kevin Brady (R-Texas), in writing his legislation, was considering having the corporate tax rate cut phase out after eight years but made a change the night before the bill was introduced to effectively make it permanent. With the news of the potential delay hitting the market, the dollar in general, and the USD/JPY in particular was the first casualty and the pair was sold by leveraged accounts in Tokyo. Markets do not like this: Another delay on the tax bill as it will not be released on Thursday. Mnuchin admits that the Corporate tax cut delay in implementation is likely. My bet: nothing gets passed. Meanwhile, speaking on Bloomberg, Treasury Secretary Mnuchin said that the White House’s preference would be to start the corporate tax rate cut next year, which again implies a material probability of delay. “Our strong preference is that the corporate tax rate starts next year. The longer we wait, the worse it is for the economy,” Mnuchin said in interview on Bloomberg TV. The fee covers both intangible goods such as intellectual property as well as consumer parts. But unlike the border adjustment tax—a proposal that Republicans have discarded—the transactions must occur within a single parent company. Business groups such as the Organization for International Investment also fear the tax could disrupt international supply chains and raise costs for multinational companies—and ultimately consumers. Last week, House Ways and Means Committee Chairman Kevin Brady defended the tax as a crucial to ensuring that companies do not shift profits overseas. He said that the border adjustment tax was abandoned months ago and that the excise tax in the current bill bears no resemblance to that proposal. With so many moving parts and even more conflicting opinions, it will be surprising if a one day delay by the Senate is all it boils down to. Overall, about 300 retailers have declared bankruptcy so far in 2017, and we are on pace to lose over 147 million square feet of retail spaceby the end of the year. Roughly 70% of America’s bright-eyed and bushy-tailed high school seniors will go on to binge drink study at a 4-year college, but, to our complete shock, less than two-thirds of them will manage to graduate with a degree. Even worse, 30% of the students will drop-out after just one year on campus. Not surprisingly, a survey conducted recently by LendEDU found that college dropouts still manage to rack up an average of nearly $14,000 worth of student debt during their brief college careers and a staggering number of them go on to default on that debt in very short order. LendEDU polled 1,000 respondents that had dropped-out of a four-year higher education institution and also held some amount of student loan debt. We wanted to find out how much student loan debt they owed when the walked away from college. Respondents were given the ability to enter in an exact dollar amount when asked how much student loan debt they held when they made the choice to drop-out of school. After averaging together all 1,000 responses, we found that when the average college dropout finally gave up on college, they owed $13,929.65 in student loan debt. LendEDU pegs the average student loan debt per graduated borrower figure at $27,975, so the aforementioned debt per dropout amount makes good sense. Under the assumption that most dropouts leave campus by the end of their second year, the debt per dropout figure is nearly half of the four-year debt per borrower figure of $27,975. That figure cut in half would equal $13,987.50, a tick above our debt per dropout figure of $13,929.65. Nearly half of college dropouts interviewed by LendEDU admitted they’re not currently making payments. …all of which resulted in nearly 50% of respondents saying they’re currently in default on their student loans. Asked why they dropped out of college, roughly one-third of students cited “financial reasons”…financial reasons that presumably get much worse after they drop out of school and ruin their credit by defaulting on their student loans. The plurality of college dropouts, 35.30 percent, cited “financial reasons” as the main reason for leaving their respective college campuses. Trailing closely behind was “social/family reasons,” which brought in 34 percent of the vote. After those two options, there was a significant drop-off. ?12.90 percent of poll participants selected “other,” while 11 percent cited “health reasons,” and 5.40 percent dropped-out because of “academic reasons.” Finally, “legal reasons” was an answer option selected by only 1.40 percent of the respondents polled. Around three-fourths (74.79 pecent) of this sub-section of college dropouts responded “yes” to the question found above. Meanwhile, 25.21 percent of those who dropped-out because of financial troubles maintained that student loan debt had nothing to do with their monetary woes. About two-thirds, 64.30 percent, of the 1,000 college dropouts that participated in this poll intended on going back to college to finish up their degrees. Contrarily, 35.70 percent of the respondent poll stated they had no plans to enroll in classes again. The fact that quite the clear majority of college dropouts with student debt are set on going back to colleges? speaks to both the regret in their original choices to drop-out and also the belief that a college degree will greatly aid in their ability to grow their future earning potentials. …student loans that we’re sure these dropouts will take despite reporting overwhelming “regret” for taking their initial round of loans. Oh well, these students have to pay for those binge drinking trip to Cancun somehow…not going is simply not an option. Earlier this year, Maui County residents in the island state of Hawaii were somewhat less than ecstatic to learn that their property taxes were going to increase by approximately $29.7 million for fiscal 2018. According to County Council member statements at the time, the additional funding was needed to help provide better public services for Maui residents. That said, fast forward just a few months and it looks like a substantial portion of those tax increases won’t go to provide better public services for Maui residents at all but rather will be plowed into the state’s massively underwater pension fund. As The Maui News points out today, Maui’s contributions to the state Employees’ Retirement System will surge 52% over just the next couple of years…and that’s if everything goes to plan. “This is a massive, massive increase,” Williams said. Maui County paid $31 million into the pension fund in fiscal 2017. But now, its payments will increase to approximately $34 million in fiscal 2018, $36 million in fiscal 2019, $42 million in fiscal 2020 and $47 million in fiscal 2021. This amounts to a total of $36 million in extra payments by Maui County over the next four years alone — and its contributions are set to remain just as high every year afterward. Williams said the extra payments were needed to help the public pension system avert a crisis in unfunded liabilities, currently estimated at about $12.4 billion. Meanwhile, as we’ve pointed out multiple times before, the victims of Hawaii’s ponzi failure will inevitably be the kids as funding gets diverted from public schools and into the pockets of a few retired public employees. Williams is correct that the increased payments will help the state pay down its unfunded liabilities and return to being able to meet its current obligations to state and county employee retirees. But a new crisis has begun — the crisis of taxpayers feeling the pressure to bail out the system. Williams acknowledged that the counties would be under more financial pressure. But, maybe there’s a better way…we happen to know of a guy who recently paid $100 million for a large chunk of Kauai and is eager to settle a dispute with locals over his massive border wall (see: Protesters Plot “Border Wall” Rally For Tomorrow…At Zuckerberg’s Sprawling $100mm Hawaiian Estate)…perhaps a 1x gift to the Hawaii retirement ponzi is the perfect solution? Sen. Tom Cotton, R-Ark., who has been one of the most vocal advocates of including repeal of the individual mandate in the tax bill, has touted the savings that would come as a result. His team said it is confident that the scoring will include similar numbers to previous reports. “We’re confident the CBO estimate will still show a substantial — north of $300 billion — savings for tax reform,” Caroline Tabler, spokeswoman for Cotton, told the Washington Examiner in an email. CBO has been criticized for years for its analyses on the effects of the individual mandate. Republicans have charged that the mandate isn’t as effective as CBO concludes and have said they want to see it repealed. Some Obamacare supporters also have said it should be stronger by becoming more expensive or should be more heavily enforced. While the CBO calculation is a boost to Republicans who want to repeal the mandate in tax reform, because it means there are still significant savings to be had from repealing the mandate, mandate repeal still faces long odds. Repealing the mandate – a broadly unpopular decision in many states – could also destabilize health insurance markets by removing an incentive for healthy people to enroll. Earlier in the day, the CBO said that according to the Joint Committee on Taxation, the “Tax Cuts and Jobs Act” would increase deficits over the next decade by $1.4 trillion, which is good enough to slip under the $1.5 trillion limit required for reconciliation. The CBO did however add that the additional debt service would boost the 10-year increase in deficits to $1.7 trillion. Meanwhile, not only were Simpson and Veselnitskaya together before the Trump Jr. meeting, as it turns out Fusion GPS was hired by BakerHostetler to represent Russian firm Prevezon in an asset forfeiture case, a firm which Veselnitskaya also represented and was the reason that she was in the U.S. in the first place. To summarize, Fusion GPS and Veselnitskaya were effectively co-workers defending a Putin-linked Russian operative on trial in the U.S. for a massive $230 million money laundering fraud. After months of blustery rhetoric and half measures, the White House is finally taking steps to undo another one of former President Barack Obama’s legacy-defining foreign-policy accomplishments. The Washington Post reports that, in a landmark ruling, the Trump administration is reversing some of Obama detente with Cuba by cracking down on travel and business with the island. Under the new rules, most individual visits to Cuba will no longer be allowed, and U.S. citizens will again have to travel as part of a licensed group, accompanied by a group representative. Americans will also be barred from staying at a long list of hotels and from patronizing restaurants, stores and other enterprises that the State Department has determined are owned by or benefit members of the Cuban government, specifically its security services. Administration officials said that the new regulations, which go into effect Thursday, would not affect travel arrangements already made or contracts already signed, which are to be grandfathered in under existing law. Trump was extremely critical of Obama’s Cuba policy during the campaign, but after taking office did relatively little to restrict the newly opened lines of trade and tourism opened up by Obama, who made it much easier for US tourists to visit the island, so long as they could justify the trip under a list of criteria issued by the Obama State Department. Trump railed against Cuba during a speech he gave back in May, sparking speculation that he would threaten to punish Cuba unless it returns US fugitives like Assata Shakur, who received political asylum on the island after being convicted of killing a New Jersey state trooper and escaping from a US prison. Trump was spurred to act over the summer after US media reported on a series of mysterious cyberattacks that targeted more than 20 US diplomats stationed in Havana, including an unusually large number of spies. Trump expelled most of Cuba’s Washington-based diplomats, and recalled two-thirds of US personnel from Havana after blaming Cuba for not doing more to prevent the attacks, though the US has said there’s no evidence to suggest the attacks were orchestrated by the Cuban government. But now that it seems like Trump is getting serious, expect more restrictions to follow as Trump follows through with other promises like barring US companies American from making deals with the Cuban military, which controls much of the state-run tourism industry. Harvey, your intelligence and the way you display your knowledge…admirable. Exceptional. But there persists a grave problem. Since it is state-sponsored concrete boots on the “paper price” of precious metals, in years we will probably see silver “skyrocket” to almost $20. Or will it be $3? The current state criminality is bedrocked…until it doesn’t matter anymore. Thank you for the years of speaking truth to the sewer (“power”). Admirable.